The 2nd quarter of 2017 was action-packed, bringing our team to over 38 different locations in 9 key markets across the United States. This coast to coast coverage came to over 12,000 miles of travel in the striking #22 Shell-Pennzoil truck and trailer, catching eyes through every stretch of highway and city visited. Engaging over 17,000 fans, customers and managers along the way, the program continues to gather insight designed to help you and your teams drive business growth. The digital presence of the program has been expanded in the 2nd quarter to provide an improved experience to fans, customers and members of Shell looking to leverage this unique asset. For fans and customers, the details of the performance display events are now regularly updated on Sport Dimension's Facebook Events Page for easy, relevant reference. It is an impressive showcase of how many key markets the program engages, tying directly to business intelligence and sales growth. Thanks to Facebook's geo-tagging system, potential customers are organically notified when an event is coming to a location near them. Since adding this information digitally, we have engaged multiple fans through our Facebook page providing more information and answering questions. For further digital exposure, it is possible to promote the events through Facebook's highly targeted ads. Contact us if you are interested in learning more. For internal stakeholders of Shell, we have updated the Shell Showcar webpage to a contemporary format with proper branding and user experience. This page makes it easier for internal members of Shell to see what the program is all about by linking to case study articles, scrolling through a beautiful set of photos, and easily submit a form to inquire about activating Shell's primary sponsorship through the program. To continually integrate and leverage your sponsorship assets, we encourage you to share this link with your colleagues in a channel that hasn't yet leveraged the showcar. We would be happy to discuss unique programs you could develop to further activate the suite of showcars. Catching potential customers right before they buy is some of the most effective marketing that can be done. This is a wonderful platform to tell the product's story and tie to performance, leveraging primary sponsorship in motorsports. Our team not only educates and hosts incoming customers outside the store, but they also gather key insights from inside the locations to deliver valuable and actionable sales information to increase sales growth. 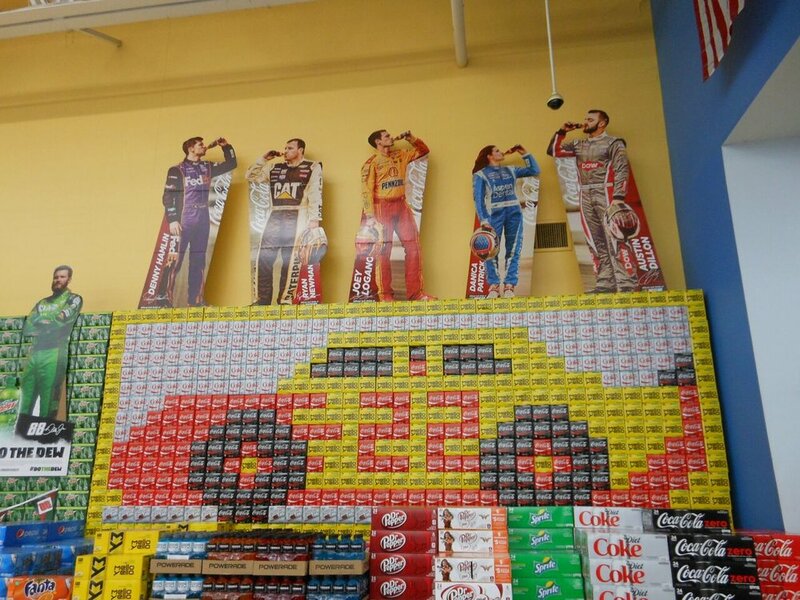 This information ranges from local promotions being run, to competitive campaigns and ensuring that Shell and Pennzoil products are always properly displayed and merchandised. Take a look at the map below where you can zoom in to each of the 9 markets the program engaged. This interactive map is a great tool for you to get a sense of the diversity of reach captured through the second quarter. You can also easily share or present the map right from this web page, using the tools in the top right. Our Experiential Marketing & Merchandising team, represented by Todd and Kendra Blevins, provides you a weekly report with some key points of detail from each market. You can find each of those reports by clicking on the photos below. 👉 Out of nine markets visited in the 2nd Quarter, three were Pennzoil branded, while the other six were Castrol stores. Pennzoil stores included Texas, Kansas and Sonoma (CA). Castrol locations were Martinsville (VA), Bristol (VA/TN), Richmond (VA), Talladega (AL), Charlotte (NC), and Michigan. 👉 There were two oil change specials on Rollback during the 2nd Quarter: Pennzoil Platinum and Castrol High Mileage February 1 - May 10, 2017; Pennzoil High Mileage and Castrol Edge May 10 - August 9, 2017. 👉 Castrol had a "The Fate of the Furious" movie ticket promotion from Mar 1-May 31, 2017. Customers had to purchase an oil change service featuring Castrol GTX High Mileage, Castrol GTX MAGNATEC or Castrol EDGE at participating service centers to get movie ticket(s), depending on which service they received. Customers could redeem online or by mail. 👉 Mobil 1 came out with a new product in March: Annual Protection Oil and Filters. Stores reported to us that it has not been selling as well as expected because customers are skeptical of only changing their oil once per year. Mobil 1 was running a sales campaign to support the product launch, offering a $10 Walmart eGift Card with purchase of 5 quarts. The stickers are on each bottle and also a shelf talker explains the promotion. Eligible for purchases made at select Walmart stores between May 31 - September 8, 2017, while supplies last. 👉 During the second quarter, we started seeing shortages for the Pennzoil synthetic products, due to problems at the refineries. Stores were not informed of why there were shortages until the Walmart Shareholders event in late May. We did not know why there were supply issues either, so we passed on the information from the stores that we received. It affected some stores ability to provide the Rollback for the Pennzoil Platinum oil change special during that time. 👉 Castrol GTX diesel continued their pallet promotion in Q2. It did not sell as well as anticipated and managers were forced to find space on the shelf once the promotion was over. Some stores put it in end caps or on one side of the next Castrol oil display pallet. Many stores were marking it down to get it to move. 👉 Rotella filters were being phased out in stores where they weren't selling well. They were also moved from the middle to the bottom of the filter shelf. 👉 New stores or store re-models are using the Pennzoil branded bottles on the department banner boards in the Automotive/Auto Care Center area. 👉 Quaker State Pit Crew oil change special for $19.99 (typically) is the best seller for oil changes, even in Castrol branded stores. Enjoy the photo gallery below with a sample of displays, merchandise, engagement and more from throughout the quarter. If you would like to see more photos from each location, or would like more information about a particular location, please don't hesitate to contact us. To learn how you can leverage Shell's performance assets to their fullest extent, fill out the form below and we will be in touch with you soon. Copyright of Shell International. Photos from Sport Dimensions. Information and website produced by Sport Dimensions.